The Community Foundation of Washington County (hereinafter referred to as “CFWC”) is pleased to announce the Delta Workforce Marketing Initiative, which is a collaborative partnership between the CFWC, the Washington County Economic Alliance (hereinafter referred to as “WCEA”), the Mississippi Delta Community College Charles W. Capps, Jr. Technology Center (hereinafter referred to as the “Capps Technology Center”), and the Delta Regional Authority (hereinafter referred to as “DRA”). 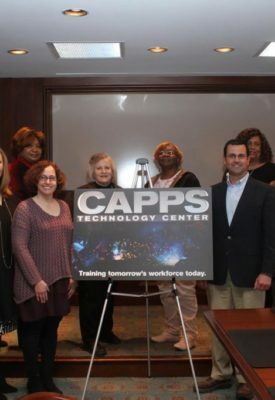 The Delta Workforce Marketing Initiative is a collaborative partnership that will work to rebrand and promote the training programs and classes of the Capps Technology Center. This Initiative is being deployed throughout Washington County, a rural community classified as high need, in all unemployment, under-employment, and underserved sectors with the goal of helping our residents become aware of the training available for skill enhancement so they can gain employment in an effort to close the middle skill job gap in Washington County. According to Terri Lane, Executive Director of the CFWC, “After extensive research surrounding the landscape of Workforce Development here in our county, it was evident to our board that many valuable training programs, services and resources existed that were targeted to help enhance the workforce training and skills of residents with the goal of helping the unemployed and under-employed successfully compete for gainful employment. However, communications and marketing are vital components towards ensuring that residents are aware of how to access and take advantage of these workforce training resources.” The CFWC and the DRA took this as a challenge and committed funding towards the development and implementation of a communications and marketing plan to work, in partnership, with the Capps Technology Center to help tell their story. Improved workforce competitiveness is one of DRA’s key strategic goals, according to Chris Masingill, Co-Chairman of the DRA, “Workforce development and training throughout the Delta region is essential to develop communities that can be competitive regionally, nationally and globally,” Masingill said. “This project will have an immediate and strong impact on the residents of Washington County, encourage attendance at workforce training classes at the Capps Technology Center and increase the ability of trainees to enhance their earning potential. “We greatly appreciate the WCEA for administering a program that will be a vital component of workforce development in the region. This program will enable area workers to access information and develop the skills necessary to close the job gap in Washington County and contribute to the growth of the Mississippi Delta economy,” Masingill added.